When is the last time you enjoyed a great banana split? I know it has been several years. I remember how much I loved them as a child. So many flavors, The split banana, ice cream and of course, the cherry on top! It was one of the best treats that summer could offer. 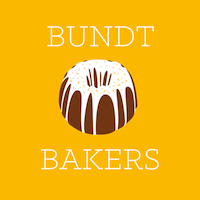 When I heard that #BundtBakers July Challenge was for a fruit and nut cake, I immediately thought of this childhood treat. Our host Shilpi from Simply Veggies really came up with a fun one, don't you think? Okay, this month's cake is really easy! You could even say it is fool-proof. I don't often bake with mixes, but this time I made an exception. The secret is a package of banana pudding and a regular white cake mix. ...Oh, and did I forget to mention the ice cream? The recipe is actually pretty simple. After baking though, comes the fun part. I decorated this cake with chocolate ganache, walnuts, whipped cream, mini chocolate chips and a cherry on top. And if you are looking for a good way to use up some overripe bananas, I have the perfect cake recipe for you. Seems like no matter how we eat bananas, there is always a never-ending supply of brown ones. Preheat the oven to 350 degrees. Grease the bundt pan and set aside. In a stand mixer, combine the cake mix, pudding and one egg at a time. Then mix in the ice cream, oil, and bananas. Pour half the batter into the prepared bundt pan, then arrange the halved cherries on top of the batter. Cover with the remaining batter and bake for 50 to 60 minutes. Remove from the oven and let the cake rest for 10 minutes before inverting onto a cooling rack. Let the cake cool completely, then wrap tightly with kitchen wrap for 8 hours or overnight. Before serving, heat the heavy whipping cream in a small saucepan to a light simmer. Pour over the chocolate chips and stir in the corn syrup till all the chocolate has melted. Drizzle this over the cake. Sprinkle the warm ganache with walnuts, let cool then top with whipped cream, mini chocolate chips and maraschino cherries with stems. Thanks for checking out this month's creation. I hope you will take a moment to check out or pin some of the other #BundtBakers creations today.